By 2015 YMCAs around the world will have a new set of branding standards to follow. Golden Technologies is working with local YMCAs to upgrade their websites and meet the new brand requirements. On July 12, 2010 the YMCA announced that they were going to move away from the well known branding behind “The YMCA” and start using “the Y” as their brand. All Ys around the world will be required to use the new brand by the year 2015. The new brand standards include a new logo, five color themes, photo requirements and more. As part of their campaign for diversity, the color themes are unable to be associated with a specific area of the Y. Golden Technologies has spent the last seven months reviewing and learning the brand standards set by the national Y in an effort to help Ys around the world transform their websites to meet the new branding standards. Golden Technologies created a theme chooser for the Valparaiso Family YMCA that is available as part of a basic Y re-brand package for other Ys. The theme chooser allows website visitors to choose from five color combination themes what they would like to see throughout the website. If no colors are chosen, a random theme will display each time the page loads. A basic package available from Golden Technologies to Ys features a design matching the new standards, a content management system, a theme chooser, search engine optimization and access to website analytics. For a limited time, new customers can choose to add on a calendar, blog or announcement feed for free. With four years of re-branding time left, Golden Technologies has already started working with a number of Ys around the United States to re-brand their website. 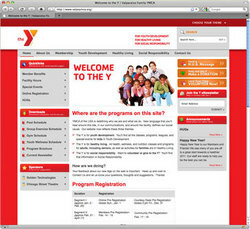 For more information on branding your local Y website visit http://www.ymcawebsiterebranding.com. Golden Technologies is a Chicagoland based company with offices in Chicago, Illinois; Valparaiso, Indiana; South Bend, Indiana; and Naples, Florida. For more information about Golden Technologies visit their website at http://www.golden-tech.com.